When Wired magazine came on the scene it was the essence of Geek Chic. It was business news for the up and comer, forward looking journalism for the techno Internet industrialists. Founded in 1993, the magazine was quick to draw raves, winning industry awards for design and general excellence. It set a standard for innovation and vision. Then the Internet bubble burst. Along with it, the audience of need-to-know-know news hungry entrepreneurs shrank. Advertisers had less interest to spend. To survive, Wired evolved and sought new readers. While peers like Industry Standard and Business 2.0 stayed their courses and shuttered, Wired became more mainstream, broader. With a wider, more diverse audience, the property survived the crash, even weathered through complex ownership issues (Wired.com and Wired magazine shared content but had different owners from 1998 to 2006). Along the way, however, Wired lost some of its “Silicon Street” credibility. Over the past two years, Advance.net, Wired’s owner, has moved to restore some of that digital cache. In July 2006, Wired magazine bought Wired News (the owner of Wired.com) for $25m. On Halloween 2006, the company acquired year old news aggregator startup Reddit. Now, in a move that further restocks the talent pool and bring back a little of the Wired of old, Advance.net has acquired popular tech news blog/site Ars Technica. Based out of Boston, Ars Technica was founded in 1998 by Ken Fisher. Currently the site draws about 4 to 4.5 million visitors a month who come to read the detailed articles on tech news and issues. Describing the deal, which was confirmed Saturday, but for which details have not been announced, Fisher said the deal is a growth vehicle. “We’re going to get broader, but also more in-depth, in areas of IT and Science,” he said. It’s widely believed Advance.net paid about $20 to $25 million for the company. That would put the price on the same level as the money spent to acquire Wired News (Wired.com) in 2006. 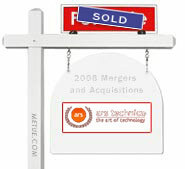 That’s also in the same ballpark at the price AOL paid in 2005 to acquire blog network Weblogs Inc. Some editorial changes are planned, but at least initially, Ars will continue to operate as its own site.